The ultra luxurious LUXE HOTEL, located on Rodeo Drive, sponsored a very important media, VIM, viewing party held in the fabulous penthouse suite that featured a wrap around roof top lounge providing unobstructed panoramic views of Beverly Hills and beyond. 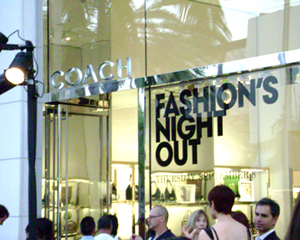 An All Access Media pass enabled pre-approved press the opportunity to enjoy Fashion Night Out on Rodeo Drive, the most luxurious street in the world, and take part in any or all of the seventy-six in-store, by invitation, or other Fashion Night Out events. LUXE HOTEL served as a central point for guests to return throughout the evening, sit, relax and enjoy the advantageous location that showcased all the chic happenings. Event attendees were treated to champagne, imported and domestic beer, softer choices, skewered basil, mozzarella and tomato hors d’oeuvres, crab cakes and chilled raspberry smoothies topped with whole raspberries. Fashion Night Out, conceived in 2009, is the brain child of VOGUE Editor-in-Chief, Anna Wintour, and in just two years has become a global phenomenon celebrated in over two hundred fifty U.S. cities and in eighteen countries from France, Italy and Japan to India, Turkey and Greece. Wintour, as an answer to the depressing economic gloom, created Fashion Night Out to restore consumer confidence, celebrate fashion and boost the industry’s economy. Since its inception Fashion Night Out has become an annual pilgrimage prelude to New York’s Fall Fashion Week. Foodies, shoppers and fun seekers strolled The Golden Triangle watching everyone enjoy the luxury Carnival theme that included a four story Ferris Wheel, stilt walkers, flame throwers, Cirque de Soleil performers, giveaways, raffle’s, parties, parties and more parties! Adding to the high end festival theme fifteen of LA’s Gourmet food trucks, positioned on Rodeo and Beverly Drive, joined in the festivities and served specialty offerings throughout the four hour extravaganza. Participants were indulged with delightful gift items beginning with a Rodeo Drive Canvas Travel Bag filled with in-room LUXE HOTEL brand items including, non-slip plush Slipper socks, their branded metal water bottle and a leather note/business card holder. From LUXE HOTEL Executive Chef James Jung, a sample of sinfully delicious Truffles, rich, Belgium chocolate shells with deep lush chocolate centers, and an invitation to attend Chef Jung’s upcoming interactive Truffle demonstration. Additional Gifting selections consisted of a Beverly Hills Canvas Tote, a melt-in-your-mouth Milk Chocolate Candy Bar and gift certificate from A. Sweet Boutique, a gift card from Kendra Scott Jewelry, a gift card from The Salon, a discount gift certificate from Peter Marco Extraordinary Jewels of Beverly Hills and a gift certificate for complimentary drinks from The Beverly Wilshire. From invitation only launch parties at PORSCHE DESIGN to complimentary make-over’s and Red Carpet photo shoots with SACHA COSMETICS to celebrity appearances at SAK’s FIFTH AVENUE, Fashion Night Out celebrated the best of the best with flair, style and panache!